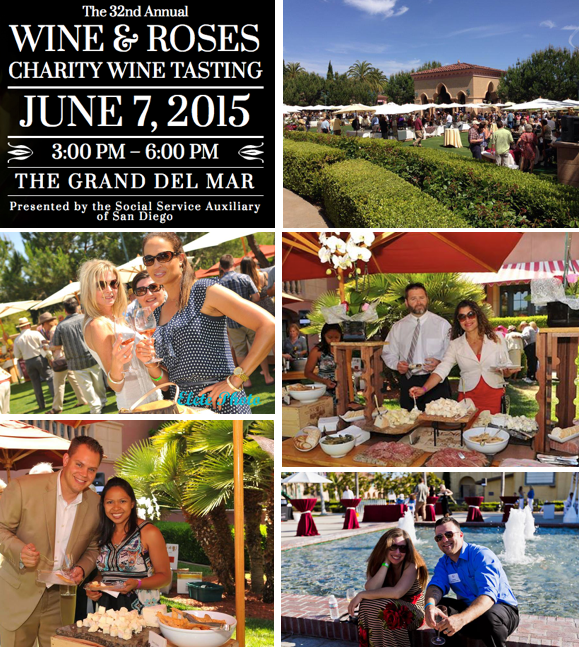 The 32nd annual Wine & Roses Charity Wine Tasting will make a lavish return to the luxurious location of The Grand Del Mar Hotel this spring for this year’s can’t-miss charitable event. The fundraiser, put on by the Social Service Auxiliary of San Diego and the San Diego International Wine Competition, will be held from 3-6pm on Sunday, June 7. All proceeds will benefit youth summer camp, Camp Oliver, located in Descanso, CA. This ticketed event is open to the public, and prices begin at $100 for general admission, $150 and $250 for VIP admission, and $2,200 for a VIP Table. Since its inaugural event, Wine & Roses has built one of the most revered wine events in the country, featuring expertly-curated wines from all over the world, available to taste and purchase all in one afternoon. The wines featured at the one-day event have been put through rigorous competition, trial and expert tasters during the San Diego International Wine Competition, which was held Jan. 17, and Jan. 18, 2015. The most award-winning wines reappear for trial and auction by revelers and vino-lovers at Wine & Roses. Wine & Roses will also feature small bites from over 30 local, gourmet restaurants as well as live entertainment. For more information, or for ticketing info, please visit www.wineandroses.net.